Are you looking for a diet plan without going for a crash diet? Then 8-hour diet is perfect for you. Many people have managed to lose 20 to 25 pounds of weight within 3 weeks by following 8-hour diet plan. This is a diet plan in which you are allowed to eat any snack only for 8 hours a day. After 8 hours, you will be on fast for 16 hours of the day. This 16 hours gap will help your body to rest and repair, and burn the calories in your body. The more calories you burn, the leaner you will be. This diet plan is guided by 2 scientific principles, even if you follow it 3 days a week. First, it is the manner in which the calories are stored in your body, which is in the form of glycogen. The glycogen stored in your liver is the source of energy that is readily available. Once this glycogen in your liver is burned, your body will have to burn fat to gain energy. The 8-hour diet makes your body burn fat and remove the flab from your body. Secondly, the 8-hour diet helps in stimulating the function of mitochondria, the source of energy inside the cells of the body. This increases the cellular output and reduces the intracellular damage caused due to poor diet. This way the aging process of the body is slowed down. It is also good for reducing the risk of cancer, heart disease, diabetes and even Alzheimer’s disease. 8-hour diet – How it Works? According to the authors of the book ‘the 8-hour diet’, ‘watch the pounds disappear without watching what you eat’. The extra pounds in your body will disappear when you eat only for 8 hours a day for three days a week. This diet helps in giving your body the chance to reset as the body gets a time of 16 hours to repair and renew. This enables your body to process nutrients and get rid of toxins effectively. In today’s lifestyle, people eat round the clock and this doesn’t give your body time to burn all the calories that it should. In this diet plan the calories intake is limited to 8 hours in a day, while the other 16 hours of the day is spent fasting. You can fast for 16 hours, 3 to 7 days a week according to your convenience. During the 8 hours, you can consume any food and beverage you desire and have as many meals as you want. Eating certain food combinations that are rich in nutrients, like fruits and vegetables, whole grains with high-fibre in them, lean protein and healthy fats. Drinking adequate amount of water throughput the day. 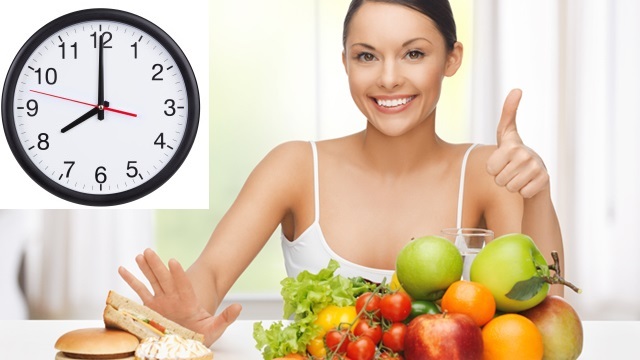 You can choose your own 8 hour period when you follow this diet plan. It can be from 9 am to 5 pm, or 3 pm to 11 pm. However, it better if you break your fast during the later hours of the day, this will help in maximizing the burning of fat and weight loss. You can also do some form of exercise just before your first meal to make this diet work more effectively. You can do exercise routines consisting of resistance training and cardio workouts. When you wake up, you can have coffee, tea or any detox drink. This diet contains a blend of savoury and sweet, high calorie and low calorie foods, which help in keeping you full for a long time. As a result, you will not have the tendency to have snacks late at night. Green tea and detox drinks help in removing the toxins from your body. Having snacks between the meals will make it easier for you fast during the 16 hours. Have at least one cup of yogurt every day for good digestion. Vegetables and fruits – You may have any vegetable or fruit you prefer. Dairy – Any dairy product is good, unless you are lactose intolerant. Fats and oils – You can include olive oil, canola oil, rice bran oil, ghee, butter, margarine and mayonnaise. Proteins – Beans, tofu, soy, eggs, lentils, chicken breast, fish, lean cuts of beef and pork, turkey, protein bars (limited amounts) and protein shakes. Dessert – Bread pudding, chocolate pudding, cupcakes, banana muffins, ice cream, homemade cakes, custard, chocolate etc. Beverages – fresh vegetable and fruit juices, detox drinks, tender coconut water, coffee, green tea and black tea. Beverages – alcohol, packed fruit juices, aerated and sweetened beverages. So, make some delicious recipes that are low in calories. This way you will be able to have food that you like and also control your weight.